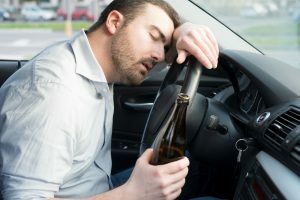 In North Carolina, it is not a violation of the law to be intoxicated in a vehicle which is not running and not in motion. That state makes it illegal for a “driver” to be under the influence. The state law defines “driver” as a person in actual physical control of a vehicle which is in motion or has the engine running. The trooper’s vehicle was not in motion, and the engine was not running, so he did not commit the offense of DUI. Well…he may have committed it, but the officers could not prove it. In Ohio, it can be a violation of the law to be under the influence in a vehicle which is not running or in motion. Ohio has a unique law: Physical Control Of A Vehicle Under The Influence. That law prohibits being in “physical control” of a vehicle while under the influence (or over the limit) of alcohol and/or drugs. The law defines “physical control” as being in the driver’s position of the front seat of a vehicle and having possession of the vehicle’s ignition key or other ignition device. The trooper in the news report would have been guilty of Physical Control in Ohio. The difference between Physical Control and OVI in Ohio is operation. While Physical Control prohibits being in physical control of a vehicle under the influence, OVI prohibits operating a vehicle under the influence (O is for Operate). “Operate” means to move or cause movement of a vehicle. Ohio’s Physical Control law, found in Ohio Revised Code section 4511.194, was enacted in 2004. Before that time, Ohio had a DUI law very similar to that of North Carolina. It seems the Ohio legislature’s rationale for the Physical Control law is we want to punish people for being under the influence in a vehicle but not driving, but we do not want to punish them to the same extent as those who do drive. Accordingly, Physical Control has penalties which are less severe than OVI. OVI is a moving violation resulting in six points on one’s driver license and a driver license suspension up to three years. Physical control is a non-moving violation resulting in no points on one’s driver license and a driver license suspension of up to one year. The element of “operation” is not often in dispute in OVI cases, but it is something which should be verified by Ohio DUI / OVI lawyers and not just assumed. In the news report, the officers just assumed the vehicle was running. It is unclear why correcting the assumption required review of body camera footage. It seems like the officers would have realized this when they had to get the keys from the arrested trooper and the vehicle was in gear. Perhaps they were preoccupied with the irony of a drunk trooper parked near the courthouse.